Bulkhead Bulkheads and other shoreline-protection structures prevent tidal wetlands from migrating landward with rising sea level. Photo by David Malmquist. The Eastern Shore of Virginia is home to some of the most extensive undeveloped coastal lowlands on the U.S. East Coast. Photo by David Malmquist. Living Shoreline: Before "Living shorelines," created by planting marsh grasses just above mean high water, provide an alternative to bulkheads and allow tidal wetlands to migrate landward with rising sea level. Photo courtesy CCRM. After The same area as in the previous image, showing the protection offered by a living shoreline. 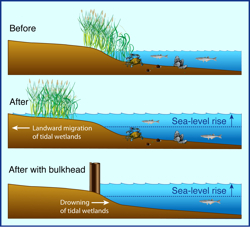 Unlike bulkheads, living shorelines allow tidal wetlands to migrate landward in response to rising sea level. Photo courtesy CCRM. Peat Wetland peat lies beneath many of the sandy beaches of the Eastern Shore of Virginia, direct evidence of sea-level rise and the landward migration of the shoreline. Here a chunk of peat is exposed at the surface. Photo by David Malmquist. A new study co-authored by VIMS professor Carl Hershner shows that more than half the tidal wetlands along the U.S. East Coast—habitats that sustain commercial and recreational fisheries, filter pollutants, and protect against storms—will disappear by 2100 if current shoreline-protection strategies continue to block their landward migration in the face of rising sea level. The study, published in the October 27th issue of Environmental Research Letters, reports the findings of an 8-year collaborative effort between scientists and local planners to map land-use policies in 131 counties from Massachusetts to Florida. Local input to the study came from wetland-board staffers throughout Hampton Roads, the Eastern Shore, and northern Virginia. The maps show that 42% of land lower than 3 feet along the US Atlantic coast is already developed and thus likely to be protected as sea level continues to rise. Land-use planners expect that another 15% of the area will be developed in the coming decades. Thus almost 60% of low-lying coastal lands are likely to be developed and eventually protected as sea level rises. Only 9% of the land studied has been set aside for conservation purposes that would allow coastal ecosystems to migrate inland. Lead author James Titus of the U.S. Environmental Protection Agency says the maps "show which lands would be protected given existing policies, to hopefully start the dialogue on which lands should be protected." Hershner, Director of the Center for Coastal Resources Management at VIMS, says the research team's findings "depict the likely consequences if we extrapolate business-as-usual management practices into the future, and clarify the need to revise those practices if we are to co-exist with natural systems in coastal environments." Tidal wetlands can keep pace with up to about 2.5 millimeters (mm) of sea-level rise per year, growing vertically by trapping sediments and forming peat. But sea level is currently rising by about 3 mm per year, and the rate is expected to accelerate to 5 to 10 mm per year in the coming decades. 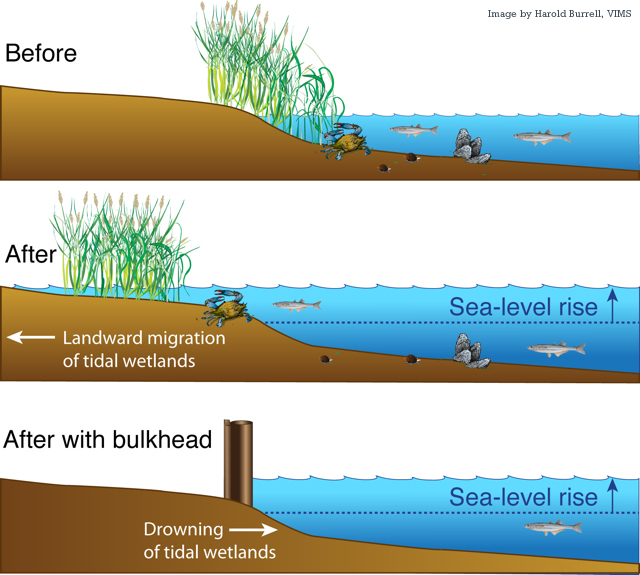 Under those conditions, tidal wetlands could only survive by migrating landward with the rising seas. Construction of bulkheads or similar protective structures prohibits this migration, essentially drowning the wetlands in place. Titus notes that "shore protection could imperil a key environmental objective in the United States: the preservation of tidal wetlands." That objective was broadly established in the Clean Water Act of 1972, and more specifically by a 1989 presidential policy of "no net loss" in the size or ecological function of U.S. wetlands. Authority for the permitting of bulkhead construction is typically shared between state regulatory programs and the U.S. Army Corps of Engineers. Currently, both the Corps and most state programs consider only the direct impacts of bulkhead construction on existing wetlands. The study's authors contend that policies should be re-evaluated in light of the impact that bulkheads have on wetland migration. Says Hershner, "In the face of rising sea level, construction of bulkheads doesn't just affect the habitat beneath the bulkhead's footprint—it also impacts the land behind the bulkhead where tidal wetlands would otherwise migrate." The authors write that tidal wetlands "may not be sustained if sea-level rise accelerates as expected. With less than 10% of the lowest land set aside for conservation, large-scale migration would require either a halt to construction in most coastal floodplains or an eventual abandonment of many developed areas." The authors suggest an alternative regulatory framework that encourages a combination of "living shoreline" techniques to preserve wetlands, and requirements to make up for lost opportunities for wetland migration by facilitating such opportunities elsewhere. The detailed maps created during the wetland study are available online at ccrm.vims.edu/climate_change/slr_maps. "Our maps can help planners evaluate the environmental consequences of current practices and policies in light of sea-level rise," says Hershner, "and also help them envision alternatives that would better preserve the environment while complying with the law." The researchers end their journal article on a cautionary note, writing that "now is the best time for wetland regulators to update policies to recognize that sea level is rising. It is also a good time for all of us to ask whether this generation should continue to build new communities in vacant land vulnerable to a rising sea."